from foot or leg pain? Footpoint Podiatry offer a full range of podiatry services for adults, children, sportspeople and people with additional conditions such as pregnancy, osteoporosis, arthritis, diabetes, multiple sclerosis and stroke recovery. Our custom-made devices are precision-manufactured to correct your foot posture and improve weight distribution and balance. Don’t live with unsightly feet, or pain in your feet and lower legs. Step up and do something about it. With the correct diagnosis, you could say goodbye to sore feet and pain in your ankles, heels, lower legs or knees. All it takes is a simple treatment plan. Make an appointment at our podiatry clinic in Clayfield, on Brisbane’s northside, and talk to our experienced team about how to feel good about your feet again. The Footpoint Podiatry Team can keep your feet happy for important events. Don’t let pain interfere with your life. Keep moving into those retirement years with the Footpoint Podiatry Team. Don’t let pain stop you. 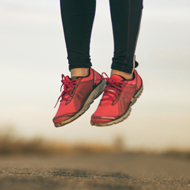 Our Footpoint Podiatry Team will ensure you can continue to lead an active lifestyle. Don’t let pain get in the way.